Ok I've been searching for instructions or a step by step tutorial on how to perform a 2 point landing. The most I got was this video, which shows a guy doing it over and over again. Cool vid but his hands move so fast I can't seem to get the whole thing down. I have been trying this for a little while now and the best I can do is get a stall a bit off the ground. I've walked it forward and it floats down but I can't seem to get the snappyness I see others do when performing the 2 point landing. Can someone either direct me to or provide a good step by step on doing the 2 point landing in the middle of the window? Can you do a crispy half-axel? If so, just fly down and down that when you get near the ground. Usually, you do a half axel horizontally. So, fly across the window and half-axel to turn around and fly the other direction. I imagine it this way - you could do that same half-axel against the side of a house at the turning point and it would basically be a 2 point landing. The kite does not care which direction it is flying, so you can also fly straight down and essentially half-axel into the ground. Thanks much! I never thought about it like that but it makes sense to me. I'll try it and let you know how that works out. This is how I'm trying to do them. I've managed to do it two or three times in the past two months and the feeling is like: "hey everyone! Did you see that?! It was me..."
As always... Practice, practice & practice. Poor ground wind, which is what I have where I fly, can cause problems with tip stabs and good landings. on the beach, it's so much easier and more satisfying. Tried Tom's suggestion today as I've never had much luck with 2 point landings. The problem I've found is that half axels side to side are easy but when I try doing a half axel into the ground my brain starts screaming CRASH and puts my arms into panic mode ! I managed a couple of scruffy ones ( and lots of spectacular nose dives) but it does work...I've just got to do a bit of brain (re) training! You could try flying down diagonally and do a snap lazy and pull both line immediately. Gradually increase the angle and fly straight down once you get the timing right. Our brain can have the strangest blocks. So what I've tried to do is: Do four or five half-axels on the left side of the window to get those hand movements deep in my brain. WARNING: I DON'T do the symmetrical half axels on the right. 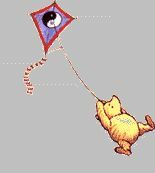 I just smoothly turn the kite on the right to repeat the half-axel on the left. Otherwise I forget the hand movements. Once I have banged those movements into my coconut, I then try to dive the kite and repeat the hand movements, almost blindly. Without paying attention to the fact that the kite is going down! I feel I'm getting better results with this strange method. The issue now is timing. Usually I do them too high, so at least I don't crash the kite. Thats just what I ended up doing and it seemed to help. Today wasn't the best of days as the wind was coming from behind some trees so I had good wind at 60' and dead air at 10' so just as I started the half axel the kite didn't have enough wind to complete it......I'll try again on a better day. Keep at it, it will come. To give credit where it is due - Lam was the first that told me to think about the 2-pt landing this way. My two point crash landings should be a tad smoother now. I don't like this method based on getting the kite into a turtle and then pulling to land the two tips. I find it quite "dirty" in the sense that it does not look like a polished trick. I prefer the one based on a "half-axel". It looks sharp even when not 100% well executed.